Wash the rice well and drain with a colander. Peel the garlic and onions then finely chop. Saute the garlic and onions in some oil. 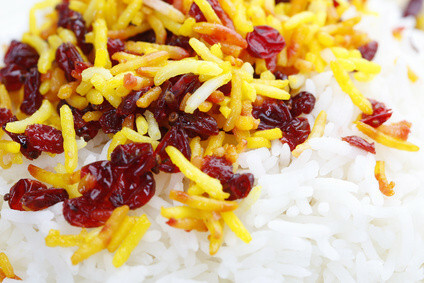 Add the rice and saffron then stir to evenly mix the color. Pour the boiling broth into the rice mixture. Seaon with salt and pepper and cook the rice dish over low heat for 20 minutes. Pour boiling water over the raisins. Drain. Add the raisins and pepper to the finished dish.